The region surrounding Saint Francis is a giant playground. Almost everywhere you turn, you’ll find nature, adventure, sports and history. Just beyond campus is the highest skiable mountain in Pennsylvania, the former personal golf course of Charles M. Schwab, a sparkling 1,600-acre lake, some of the best white water rafting in the East and dozens of miles of hiking and biking trails. The following is a list created by our students of things to do on and around campus throughout the year. 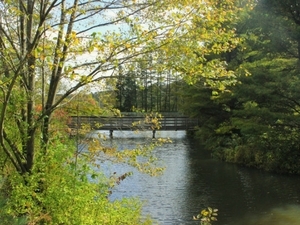 Take a walk on the nature trail around the lake or just sit by the lake to relax with some friends. Regardless of your denomination, Saint Francis offers countless opportunities to get involved with fellow Christians. Cru, Campus Ministry, Bible Studies, and the Overflow service all host weekly events and services that allow college students to stay connected and grow their faith. Race your friends down the slope at the Lakeview snow tubing park on campus. Smithmyer's Superette - Smithmyer's is a family owned and operated grocery store with an in-store meat department and in-store bakery! Turn right out of the main entrance of the University. Travel through Loretto (bear right at circle with monument) and Smithmyer's will be located on your left. Turn right out of the main entrance of the University. Travel through Loretto (bear right at circle with monument) and travel approximately 4 miles to the first stop sign. Turn left into Cresson (Dollar General on left) onto Admiral Peary Highway (Rt. 53). Travel past the McDonald's on left and under the railroad overpass. Immediately following the railroad overpass turn left onto Front Street. Vito's is in the fourth block down on the right. Follow above directions to Vito's Restaurant & Pizzaria. Instead of turning left immediately after the railroad overpass continue straight on Admiral Peary Highway (Rt. 53). At the next intersection turn right. Cresson Springs sits on the corner. Turn left out ofthe main entrance of the University. Travel 7 miles to the first traffic light. Turn left at the light. Bear right onto the ramp leading to 22 East towards Blairsville, Pittsburgh. Travel approximately 3-4 miles, past the intersection to the Wal-Mart Plaza, to the next large intersection (McDonald's and Wendy's on right). Turn left at this light and follow sign to the Ebensburg Mini Mall. Travel to the next stop sign. Turn right at the stop sign onto New Germany Road. The Mini Mall is located directly on your right. Off the Rak is the last building on the right. Turn left out of the main entrance of the University. Travel 7 miles to the first traffic light. Turn right at light onto Main Street. Follow Main Street towards the center of town and up the large hill. At the top of the hill is the main intersection. There are a variety of restaurants located along the Plank Road Exit in Altoona To the right is Outback Steakhouse, T.G.I. Friday’s, Primanti's Bros. To the left is the mall (Applebee’s is in the mall), Cracker Barrel, Denny’s, and Eat-N-Park. If you are looking for fine dining we suggest The Allegro. This restaurant specializes in Italian cuisine. It is located on Broad Avenue and 40th street. To make reservations call 814-946-5216. Turn right out of main entrance of the University. Travel through Loretto (bear right at circle with monument) and travel approximately 5 miles to the first stop sign. Turn left into Cresson (Dollar General on left) onto Admiral Peary Highway (Rt. 53). Travel to the next traffic light at the Sheetz Gas Station. Continue straight through light up hill. At the top of the hill follow signs to 22 West, Hollidaysburg, Altoona. Enter 22 East and travel approximately ten miles. 22 East will split, follow signs to 220 North/I-99, Altoona. The first exit off of 220 North/I-99 is Plank Road Exit. There are a variety of restaurants located in and around the mall in Johnstown. In the mall complex is Lone Star and Ponderosa. Located inside the mall is the Ground Round and the Italian Oven Restaurant. Turn left out of the main entrance of the University. Travel 7 miles to the first traffic light. Turn left at the light. Bear right onto the ramp leading to 22 East towards Blairsville, Pittsburgh. Travel approximately 4 miles, past the McDonald’s and Wendy’s. Bear right onto the ramp leading to 219 South towards Johnstown. Follow 219 South approximately 12 miles to the Galleria Drive Exit. Turn left at the top of the exit ramp. Red Lobster, Perkins, and Applebee’s are all located on Galleria Drive. The mall entrance is located off Galleria Drive. Captain Michael McGuire Park - A multi-use community facility to promote health and fitness while celebrating the historical, religious, and cultural heritage of Loretto. Chapel - The Immaculate Conception Chapel hosts a daily public mass schedule. Dining - Our dining facilities are open to the public. Check on the hours-of-operation and this week's menus! The Grotto - This beautiful outdoor spiritual space includes a replica of Our Lady of Lourdes Grotto, the Pieta statue, a Nativity scene, in addition to the Stations of the Cross. It can be accessed from a paved path across from Cafe Gubbio. Immergrün is a short demanding course that serves as the on-campus home of the Red Flash golf and cross country teams. Located on the Saint Francis University campus, Immergrün has never been altered since it was built for Charles M. Schwab in 1917. Schwab Gardens gardens of the magnificent former Charles M. Schwab Estate (now Mount Assisi Friary) are open for public viewing. The Italian Renaissance style garden was created by Charles Wellford Leavitt Jr., a pioneering landscape engineer who also designed Forbes Field. Southern Alleghenies Museum of Art - SAMA exists to preserve, exhibit, and advance American art and is dedicated to making its programs and activities accessible to the people of the southwestern area of central Pennsylvania. Theatre at Saint Francis University creates a unique avenue for students and area residents to come together as they learn and grow in their theatrical abilities. Stokes Athletics Center Natatorium - The natatorium features a 6 lane 25 yard pool that is used for competitive and recreational swimming. View the swimming pool homepage. Participate in an organized bus trip to see the Pittsburgh Pirates play at PNC Park. It is a fun, inexpensive way to take a trip with friends off campus. Food, friends and e a game of corn hole in the JFK parking lot is the perfect warm-up before attending the Red Flash football game, even on a rainy day. SFU has many options for traveling and studying abroad, one of which being their site in Ambialet, France. Students live in this cozy town in the south of France, but also get to travel to Paris, Barcelona, and many other exciting places! The Business School's Enactus group competes annually in National competitions judged by CEOs and Fortune 500 leaders. Classes can be stressful. SFU invites the local Humane Society to visit with adorable puppies to play with. SFU offers many diving courses, which is perfect for anyone in the marine biology field, or anyone who just wants to pick up a fun hobby! SFU has many mediums in which students’ work is published and celebrated! From photography being showcased in the library to articles being published on the Troubadour’s website, there is no shortage of artistic expression being encouraged and acknowledged here at SFU. 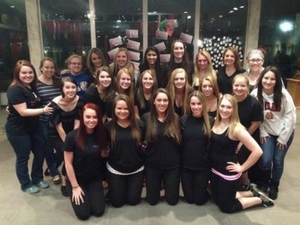 SFU has 12 fraternities and sororities, and they participate in many events together throughout the school year. Greek week takes place in the spring, and has competitions such as Greek Sing, dodgeball, flag football, and more! Upperclassmen can serve as “Orientation Counselors,” who help students move in and adjust to college life here at SFU! There are many events during orientation weekend, one of which being a “welcome” speech by the Student Government Association president. The Homecoming parade takes place every year, rain or shine! The Homecoming court, band, and other clubs and organizations make floats that the whole town comes to see before the football game. Bolstered by a large international student population, SFU encourages open-minded discussions in the classroom and holds events such as Multicultural week to highlight the different contributions that each country makes to Loretto, PA. There is a haunted house and corn maze set up in Portage every year around Halloween. There are carnival games and chances to win a great pet fish for your dorm room. In the fall, local farms sell pumpkins, which provides the opportunity to carve them! After selecting the perfect pumpkin, carving with friends and roasting the pumpkin seeds is always a good time. Here at SFU, we are the school among the pines. So go enjoy the outdoors with a couple friends, but be careful! The Student Activities Organization always sets up a lot of fun activities for Spring Fest here on campus. Last year there was a petting zoo, this giant trampoline, and more. There are many leadership opportunities on campus, including the opportunity to serve on the Student Government Association. It is led by an Executive Board, who attend the Conference on Student Government Associations every year to sharpen their leadership skills and get new ideas to bring back to campus! Join in the victory dance from the sidelines! The Red Flash Dance Team embodies school spirit at all home Football and Men’s and Women’s Basketball games. These students have the opportunity to cheer on the teams both during the regular season and playoffs! Students travel to Washington D.C. every year. This year they toured two large churches in D.C. During downtime, students were free to explore D.C. Here, a group of students snapped a photo in front of the Lincoln Memorial. At Donut Heaven, the Student Government Association (SGA) provides donuts, coffee, ice cream, nachos, hot dogs, and more for the first three nights of finals week! Each semester, faculty members serve the food to their students in a show of solidarity and appreciation for their hard work! One of the greatest things that SFU has to offer is its natural beauty. The gardens are a lovely place to go alone to collect your thoughts, or to take a walk with a friend. The Student Government Association Leadership Conference, held every fall semester, is just one of many events aimed to educate and inspire SFU students to be the best leaders and citizens of a global community that they can be! Upperclassmen can serve as Orientation Counselors who help students move in and adjust to college life here at SFU! There are many events during orientation weekend, one of which being a welcome speech given by the SGA president. Two students are pictured here with University President Father Malachi Van Tassell. SFU fosters many service opportunities, including mission trips over spring break. Groups such as H.U.G.S. United and Habitat for Humanity send a team to different areas of need every year! Students pictured are in the Dominican Republic. SFU's campus is quite the spectical in the fall. Every turn you take on Manor drive will reveal incredible scenes with vivid, fall colors. Another leadership opportunity involves becoming an RA. This consists of assisting students in their residence halls through a variety of ways! SFU attends Student Advocacy Day in Harrisburg every year. Here students and Financial Aid employees meet with our representatives to discuss the importance of funds for higher education. SFU students frequently serve the surrounding community. One example is these Public Health students providing a health fair to the students of the Penn Cambria school district on R.E.D. Day, the University-wide day of service. Grouped with an Annual Course offering, the Shields School of Business conducts a trip to London every Spring Break. Over the course of ten days, students are given the opportunity to explore the financial heart of London and to gain a sense of British culture. At SFU, a JIFE (Job/Internship Fair Extravaganza) is held each year to give students the opportunity to network and market themselves to who could be a future employer. Take a Trip to New York! A bus trip to New York is offered in the fall for a small fee, which covers travel. The bus leaves early in the morning and returns late at night. Once in New York, students can shop, walk around, or do whatever catches their eye.